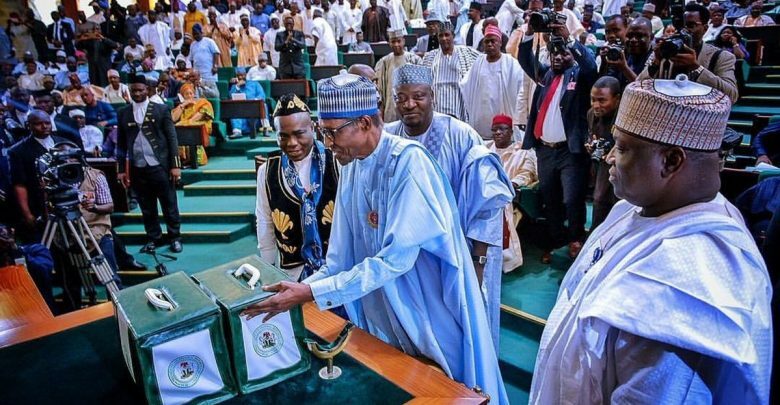 It was a costly drama laced with breach of protocols and shouting match as President Muhammadu Buhari on Wednesday, December 19, 2018, presented 2019 Appropriation Bill at the Joint seating of the National Assembly. The breach of protocol was observed when as soon as President Buhari concluded his speech, the session turned rowdy again, thus causing the tactical avoidance of speeches by both the chairman and vice of the National Assembly, Dr Bukola Saraki of the Senate and Barr Yakubu Dogara of the House. This forced the Presidential Guards Brigade band to play the National Anthem, even while Buhari was still seated which signaled the sudden end of the budget presentation ceremony. Accordingly, stern looking security operatives whisked away the President out of the chamber leaving the lawmakers behind. Saraki later led senators out of the House chamber without reading his address again.